I don't think it's intentional. I didn't even notice initially because I kept hanging out in Rider's neat-little-pyramid parcel which is lit by a variety of point lights and whatever this is it doesn't seem to be affecting point lights. Except it's not just darker it is lighter too in certain issues. Depth of color is shallow or something. I'd comment on the JIRA in question but I appear to have no means to add comments to JIRAS or perhaps I just can't figure out how. I notice this dark outfit I sometimes wear really highlights it. Both these photos were taken on the fringe of a point light in a dark night interior scene with shadows enabled. That is a the scene with an EEP viewer. That's the scene in a not-EEP viewer. The not-eep skirt is near pitch black in the night light the dark furniture is dark almost black. The EEP scene is oddly washed out except for the dark creases across the skirt. So like in the light colors are dimmer and the dark colors are brighter. A friend who sticks his nose in viewer rendering code for <censored> and giggles claims gamma and light sources are borked. Though honestly I have no knowledge that'd let me verify that claim but something is definitely off and it kinda drives me nuts the longer I use a EEP viewer. Particularly the dark scenes. but something is definitely off and it kinda drives me nuts the longer I use a EEP viewer. Particularly the dark scenes. Yeah I agree. This drives me nuts too, but I'm sure it will get fixed before EEP is released. They would be crazy to release it like that. This breaks every alpha blended texture. The EEP feature itself is working really well. The rendering changes that came along with it are still really buggy. I doubt EEP will go to RC until the rendering bugs are fixed. Hmmm I didn't get the alpha blend one, that tail is alpha blended and ALM is going in those photos. Though I have seen that in not-eep in rather specific dark conditions at a club. This one club I dance at regularly my lipstick is always blackish as is my tail. Next time that DJ does a show with that light system she likes to use I should take an EEP viewer there and see if the issue gets more pronounced. Though I have seen that in not-eep in rather specific dark conditions at a club. This one club I dance at regularly my lipstick is always blackish as is my tail. The same kind of effect will reproduce in Non-EEP, but only when under projector lights with a high ambiance setting. BUG-5852 - Projected light with high Ambiance setting causes textures containing transparency to render too dark. It's exactly the same effect though, it's like on EEP viewers with ALM enabled, the light from the sun behaves like a projector light with high ambience & that breaks alpha blended textures. Try viewing your tail under the default midday setting on EEP at different camera angles & you'll see the bug. Hi, I am interested in the EEP project insofar as it provides the 24 hour day cycle etc. As yet I don't see on my about land tab the environment editor with the day offset etc buttons. I downloaded the newest sl viewer for that purpose and apart from the fact it takes a long while to load, the opportunity for day offset isn't there. is it me, or am I just too early for it? At the moment you can only use EEP on regions running the RC Snack server version. The region Hippotropolis is running Snack. You will be alble to create & modify & see your EEP skies, waters & days locally on any Snack region. Comparison time again. Current EEP and Current Viewer. Current Viewer Midday on my build platform. EEP viewer, midday on my build platform. Very similar, we are getting somewhere. We do, however, lose some shadow depth. Shadows are a bit deeper and darker on official viewer. I kind of like it that way. The lighter the shadows become the flatter the colors grow. EEP shadow is has a Value of 51. Official viewer shadows have a value of 37 and are ever so slightly blue (5D5D5E). White in both values is a true white of FFFFFF. Light is where I like it, but the shadow needs to deepen a hair. Moonlight is back YAY! night is oddly bright, BOO! I had a hard time finding that photo in my heap of pictures because my eye kept registering that thumbnail as not-night. SL midnight shadow has a V of 15. It's 1D2027. Dark dark darks as heck. Oppressive, makes you want to turn on a light if you are in a room with shadows enabled, kinda like how you would if you were in an unlit room in the middle of the night in other life. EEP midnight shadow is 4a4e57. It's a softball shadow with a V of 34. EEP midnight shadow is MORE then twice as bright as SL midnight shadow. Lit white platform is 5A5A9A. It's almost like you take swatch of SL noon-shadow and double down on the blue and leave R and G where it is. Current midnight is blue as all get out. This is not an uncommon thing in games to project a feeling of darkness, even if you look outside and things are mostly just dark in real life. Blue colors just feel darker. EEP midnight platform is kinda a midtone grey. It might actually work if some more murk was thrown into the shadows. The narrow color depth though kind of kills the feel for me. Makes night feel weirdly bright. And now that I nitpicked the extremes of light and dark, I'll do a quicker go over of sunrises and sunset lights. I like the mistiness. The perceived depth though is again off. Shadows oddly light. I am unsure how I feel about whiter sunlight. Good news is, the sun in and of itself remains nice and vivid as it always did. Color and shadow though sorta mute the mood. Overall impression, current EEP lighting feels a lot flatter and lacking in depth. If you could keep the light where it is in a lot of the scenes and deepen the shadowy darkness I think we could have a winner. Someone asked me to compare windlights. So I used Doomed Space Ship. This is Doomed space ship on a standard viewer. It is dark, it is sinister. It is red. This is Doomed Spaceship on EEP. My existence is now pink. The ground is lacking in a texture because I had teleported a few times, and group chats happened and my VRAM was like "that's it I'm done." Earlier EEP that was dark and this iteration share a similar problem: the color is just lacking contrast. I'm curious on what LL's thought process is on these changes to how windlight settings are displayed. I doubt that no one in the office noticed that the environments weren't being displayed correctly. Are you guys trying to change how the default settings look by changing how all sky settings are rendered? Or is this an attempt to fix something people might not notice, like were scenes initially too dark because you tried to adjust how the gamma slider was weighted to give us more control over it or what? I mean, it's obvious things were being displayed too dark, and now they're being displayed too washed out, you guys didn't need our feedback to know that. If you're not trying to change something couldn't you just load up SL on two computers and adjust the EEP exporter until the settings looked the same on both computers? What's the game plan here? If we understand where the change is coming from it can help make our feedback more meaningful. Okies. I can see the fun of Kitty Moons and Pizza skies, but there seems to be no way to move the sun or moon around without first loading your own preset. What am I missing? EEP has a whole bunch of new shaders, so it's never going to be a 100% match with legacy. I believe Graham is still working on the shaders. but there seems to be no way to move the sun or moon around without first loading your own preset. What am I missing? Correct, you cannot locally edit an environment on land you don't own like you could with legacy windlight. I really hope that ability gets added before the full EEP release or photographers are not going to be happy. I'd love to see a redesign of that floater to be more like the Firestorm environment editor, which takes up much less screen space. So, now that EEP works on Bluesteel, it's more fun playing with EEP. The testing regions on Aditi were cool, but, it's flat, so you don't really get a sense of what you are doing. So, first thing I notice, yes, the settings files in the library are way off, they don't compare to the originals. Also, I don't know if it is related to EEP at all, but in that viewer, land textures are extremely blurry. The line in the middle of the sky is a known issue, I think, but now that I can have mountains, I see a similar line dancing around the mountains in the distance as I cam around. I don't mind not matching precisely with legacy if it is a qualitative improvement. However, if it murders all contrast on all existing content and forces everyone to create/purchase custom content or suffer washed out color. Then it isn't good. However I do understand it is a work in progress. I will keep making noise where I don't like the look. Hopefully it ends up looking attractive in the end. Was in an EEP sim and someone pointed out the stars were doing a weird thing. I looked up and lo and behold parallax betwixt the stars/moon/clouds made it look like the stars were the nearest objects, rendered on a dome about the breadth of our sim surround. On the plus side, the moon does obscure out the stars. Which is kinda trippy since the parallax makes the moon look distant and the stars look near. 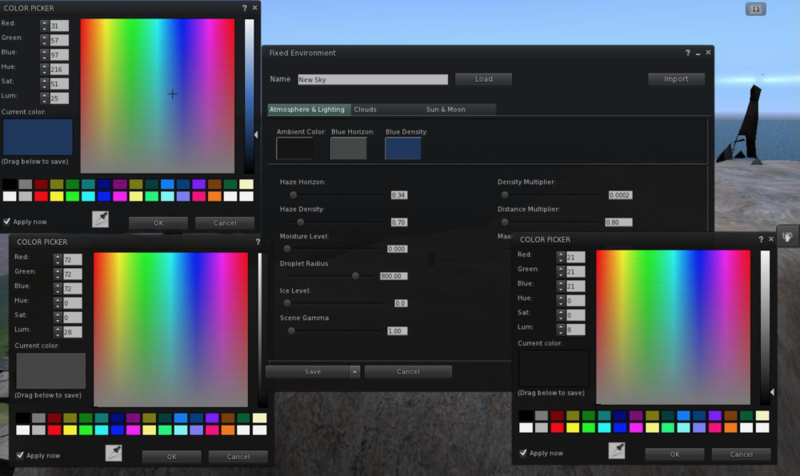 The impression I got from Rider at today's content creation dev meeting is that the importer is not going to be able to 100% accurately convert sky settings from Windlight to EEP, but that this is only a limitation with converting sky types, not a limitation on what we can create in EEP itself. In other words, converting existing sky settings won't be perfect but you'll be able to get results better than what you can do in Windlight when making new skies in EEP itself. Of course, I only have Rider's word on that, I'll have to actually play with the new tools myself to know for sure. Maybe I'll try and do that sometime this weekend. So, at the meeting today, someone mentioned that the moving shadow problem might be related to sculpties bounding box. So, I tried with mesh. It does it on mesh, on avatars and on terrain, as you will be able to see in this video. Yeah, but I'm not saying you need to reproduce existing content precisely. I'm saying we ought to nail the level of light/shadow to be in the vague ballpark as it in the very least. If everyone finds every single one of their sims washed out and lacking contrast there shall be butthurtedness. If everything is kinda different but dark is still dark and bright is still bright and they got awesome windlight tools they probably won't notice. And i'm not about those weird artsy windlights either where everything is like two-tone, I figure those are a lost cause. I'm talking like your bog-standard day/nights with a bit of tint to make the sim look different. Though I am pleased night time has moonlight now. I was trying all sorts of shenanigans to try to sneak the sun behind the moon between sunset and moon rise. This may be crazy talk, but if you are up to your elbows in editing up the default day cycle windlight you should totally get a mole to kick it up a notch. Though I may just be a helpless mole-fan. I JUST DISCOVERED A THING after posting this. In this jira I had reported some strange parallax between the stars and the moon. I noticed I couldn't get stars in an elevated desert scene. Well, right now I tried flying up. The stars are on a dome that are affixed to the ground. The star "ceiling" is at 780 meters. If you are above this point you can not get any stars above you. I added a comment to the previously linked jira to that affect. With EEP, it seems impossible to make distant objects blend into the sky, no matter how you tweak the settings. Distant objects become cutout grey-white against the sky. EEP seems better than Windlight at fog at close range though, but I'm not sure. Here is a video showing objects at various distances. First half of the video is in firestorm : observe how the landscape gradually fades into the sky. I don't have time to test right now but I believe that fog problem on EEP only happens when ALM is enabled too.